I was cleaning a carpet at a home in Tampa FL when I was struck by how much dirt I was removing from the carpet. I'm a carpet cleaner so seeing soil coming out of the carpet is not unusual, but this was after a single pass. The carpet cleaning was really lightening up the carpet with not a lot of effort. I'm not often surprised by how good Chem-Dry's carpet cleaning service is but I get used to it and just expect carpets to come clean, but this carpet I was not expecting to come clean easily. I think this picture says it all. 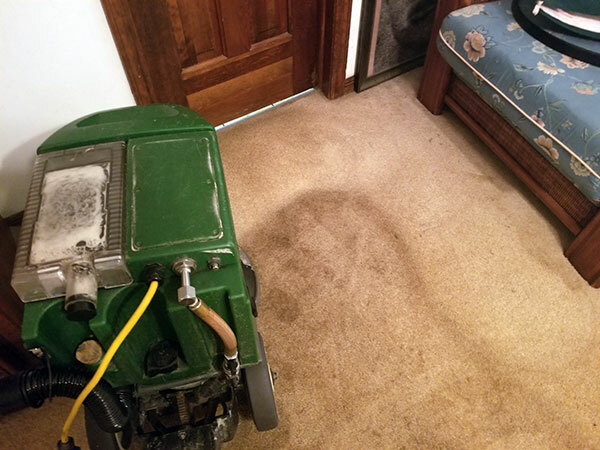 The extracting machine just made a pass over the carpet and the area where the carpet is significantly lighter is the cleaned area. I cleaned in front of the chair on the right side of the picture and then brought the carpet cleaning extractor in front of the bathroom door. I was watching were I was maneuvering the extractor and wasn't as focused on what it had cleaned. When I looked over I was taken aback at how clean the carpet was after the first pass. In Tampa FL heavily soiled traffic lanes in carpet is common with all the sand we get down here and it can be removed with a few passes but this was exceptional carpet cleaning. I just thought I would share this image because both my customer and I were extremely happy with cleaning results.